We have constructed the ultimate giant inflatable slip n’ slide! This is not your average slip n’ slide, measuring in at a whopping 60 feet this slip n’ slide is sure to make your heart race. Campers start by slipping n’ sliding their way down a crazy hill and end up splashing into our small lake at 8K Ranch. This is an all-day activity combined with zip-lining up at 8K Ranch, the home of Ajax Sleepaway. Campers will be transported to the ranch and lunch will be provided there. 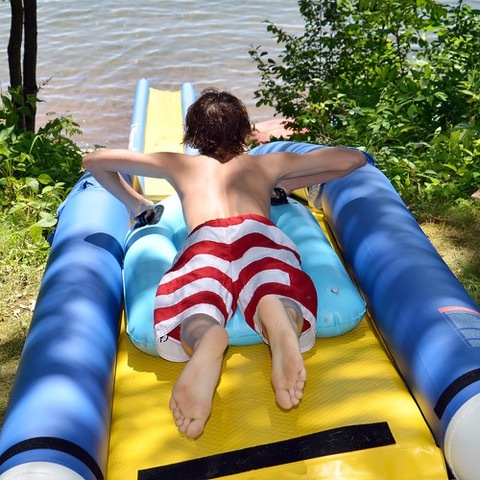 Please note: because this activity is located at 8K Ranch, the home of Ajax Sleepaway, sleepaway campers will have this activity offered nearly every day at camp. For day camp this full-day activity is offered twice per week. We ask that you, please reserve a space online for Zip/Slip day if you would like to participate as part of day camp.